Maria Bamford is an American stand-up comedian and star of the semi-autobiographical Netflix comedy series, "Lady Dynamite". 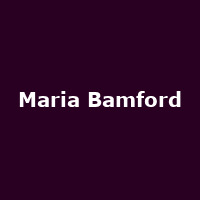 "Maria is the creator and star of Maria Bamford: "The Special Special Special" and of the cult hit web series "The Maria Bamford Show", which screened at the Museum of Art and Design. She was the first female comic to have two half-hour Comedy Central Presents specials and starred alongside Patton Oswalt, Zach Galifianakis and Brian Posehn in the Comedy Central series The Comedians of Comedy and Netflix's Comedians of Comedy: The Movie."